Methods: This was a retrospective study from July 2008 to June 2017. All procedures were done with the endoscopic technique using a tubular retractor. Patients with the hematoma volume between 30 to 80 ml, with the Glasgow Coma Scale (GCS) between 5 to 14, and evidence of severe mass effect, were included in the study. Results: The average stay in the intensive care unit was 6 days (range 1–17 days). The median pre-operative midline shift of 8.3 mm was reduced to 2.7 mm after surgery. The average hematoma removal ratio, the duration of surgery, and the blood loss was 90%, 90 min, and 60 ml, respectively. There was improvement in the average pre-operative GCS from 9.4 to 11.3 at seventh post-operative day. The post-operative mortality rate was 10.7%. A good outcome was observed in 71% patients at 6 months after surgery. Larger the volume of hematoma, more the operative time, more the pre-operative midline shift, and poorer the GCS, significantly higher was the association with mortality. The patients with a better pre-operative GCS were associated with a better Glasgow Outcome Score. The follow-up period ranged from 7 to 115 months. Conclusion: Endoscopic surgery with the help of a tubular retractor was effective and safe. It allowed for a good visualization of the hematoma and the surrounding brain, and helped in proper hemostasis. The hematoma may also be removed with the help of the microscope and the tubular retractor, in case any difficulty during the endoscopic technique is encountered. Key Message: Endoscopic surgery with the help of tubular retractor was effective and safe with additional advantages of a good visualization of the hematoma and better control of the intra-operative bleeding. The procedure reduced the stay in the intensive care unit. The average hematoma removal ratio was 90%. A good outcome was observed in 71% of the patients at 6 months after surgery. Patients with a better pre-operative Glasgow Coma scale (GCS) score were associated with a better Glasgow Outcome Score. A larger hematoma volume with more pre-operative midline shift, and a poorer GCS were associated with a higher mortality. Small-enhancing foci (the spot sign) on computed tomographic (CT) angiogram are usually associated with enlargement of the hematoma. This radiological sign may be considered as an indication for surgery. The use of aspirin and concurrent intraventricular hemorrhage (IVH) are also associated with enlargement of the basal ganglionic hematoma. Such patients should be closely monitored and surgery can be performed when the hematoma expands and is accompanied by a deterioration in the level of consciousness. Surgical procedures such as decompressive craniectomy with or without, evacuation of the hematoma could reduce the mortality in patients in coma, with significant midline shift and raised intracranial pressure (ICP), who were not responding to the medical management., Microscopic removal, has also been shown to improve results in ICH. Brain injury resulting from the conventional surgical management may counteract the potential benefits of hematoma evacuation. The minimally invasive approaches have the advantages of avoiding brain damage. Results of the reported endoscopic procedures,,,,,,,,,,,,,,,,,,,,,, and the studies on minimally invasive stereotactic aspiration and thrombolysis,,, have suggested that some patients with ICH could benefit from hematoma evacuation. This study was aimed at evaluating our results in 270 patients in whom endoscopic evacuation of spontaneous ICH of the basal ganglionic region was done. We have also reviewed the relevant world literature related to the management in such patients. To the best of our knowledge, this is the largest series of endoscopic treatment of basal ganglionic hematoma [Table 1]. This was a retrospective study of 270 patients with hypertensive basal ganglionic hematoma with or without intraventricular extension, operated between July 2008 to June 2017. The study was approved by the institute ethics committee. Written consent was taken from the patients or their legal relatives. A good history and a detailed physical examination were performed. All the appropriate investigations were carried out. The tubular brain retractor of the inner diameter of 18 mm was used. A 0° rigid scope, 30 cm long and 4 mm in diameter (Karl Storz, Tuttlingen, Germany) was used to remove the clot. Pre- and post-operative CT scans were done [Figure 1] and [Figure 2]. The patients with a large hematoma were subjected to surgery without any CT angiography. During the study period, the patients with a small sized hematoma (n = 96), who were advised conservative management, underwent a CT angiography. The post-operative scans were performed on Day 1, and later on, as required. Any brain contusion or infarction, and the amount of hematoma removal, were documented. The volume of intracranial bleed on CT scan was calculated by the ABC/2 formula (A is the maximal diameter of the hematoma, B is the diameter 90° to A, and C is the approximate number of CT slices with hemorrhage multiplied by the slice thickness). The ‘hematoma removal ratio’ was calculated by estimating the volume of post-operative hematoma and dividing it by the pre-operative hematoma volume, multiplied by 100%. This percentage figure was subtracted from 100 to obtain the hematoma removal ratio. All these patients having an intracranial hematoma were initially admitted in the medical specialty wards and were investigated by the medical team. Patients requiring surgery were shifted to the neurosurgery intensive care unit (ICU) or ward. The pre-operative and post-operative midline shifts were also recorded. The standard medical care such as the management of hypertension, coagulopathy, and intracranial pressure (ICP) control was also done. Hypertension was controlled, aiming at a systolic pressure of <170 mm Hg. The head end of the patients was raised to a 20° angle. The GCS was documented before surgery, at Day 1, as well as 7 days after surgery, and also at discharge. The Glasgow Outcome Scale (GOS) score was recorded at a follow-up of 6 and 12 months. For the ICH associated with oral anticoagulant therapy, anticoagulation therapy was discontinued. Surgery was undertaken after normalization of the international normalised ratio (INR) when the patient's condition allowed us to wait. Urgent surgery was done when there was a large hematoma with a gross midline shift. Our policy was to operate upon these patients as early as possible. Delay in surgery was due to mainly three causes: a. The late arrival of patients; b. In the circumstances, where the initial plan was to administer conservative treatment, but later, due to clinical deterioration and an enlargement of the clot, surgery was undertaken; and, c. The intentional delay in undertaking surgery was to permit reversal of the effects of anticoagulation therapy in patients who could wait. Treatment by antiepileptic drugs was carried out when the patients had an early seizure; antiepileptic drugs were also administered prophylactically in all the patients. Prophylactic antiepileptic therapy was continued for 30 days, was gradually reduced and eventually stopped. If seizures re-occurred, the patients received long-term treatment with anticonvulsant medication. The patients were classified into the good grade GOS (grades 4–5) and the poor grade (GOS 2–3) groups. Any death that occurred within 1 month was classified as post-operative mortality. A hematoma volume between 30–80 ml in the basal ganglionic area, the patient's GCS being between 5–14 and evidence of severe mass effect, were the inclusion criteria for the study. Any deterioration in the patient's consciousness level after ruling out other causes of deterioration, was also considered as an indication for surgery in those patients in whom the hematoma volume was 30 ml or more. The patients with an ICH volume of <30 ml, having the GCS score of 15, and those with a thalamic, brain stem or cerebellar hemorrhage, were excluded from the study. The patients with a lobar hematoma, a superficial clot, a hematoma secondary to a ruptured aneurysm, an arteriovenous malformation (AVM), any other vascular anomaly, moya moya disease, or venous sinus thrombosis were also excluded from the study. The patients having a hematoma secondary to a tumor, a hematoma secondary to a hemorrhagic conversion of an ischemic infarct, and a hematoma that occurred due to a traumatic brain injury were excluded. Patients with bilateral fixed dilated pupils, and end-stage renal or liver disease were also excluded. Data were analyzed using the Statistical Package for the Social Sciences software, version 20, after proper validation of the data. Paired t-test was applied for analysis of mortality in relation to age, volume of hematoma, timing of surgery after the stroke, duration of surgery, and pre- and post-operative midline shift. The chi-square test (χ2) was used for the analysis of mortality in relation to gender, diabetes status, smoking habit, and alcohol intake. A P value of <0.05 was taken as a significant value. General anesthesia was used and a skin incision of about 4 cm was given at an appropriate point of entry on the scalp. The dura mater was opened after a small craniotomy. The entry points were decided by the location of the clot and its long axis. The middle frontal gyrus was the most common site of corticectomy; the eyebrow incision was also the approach used in some cases. A small surgical corticectomy of 6–9 mm was made to reach the hematoma. Two micro-dissectors were used to split the brain tissue to reach hematoma. A portion of the clot that came out spontaneously through the cortical opening was removed. The silicone tubular retractor of appropriate length was then used to maintain the access to the hematoma. The tube used was of 1 mm thickness. It was cut along its longitudinal length to reduce its size by folding it, so that it could be passed through a small brain opening. The Killian nasal speculum was used to slowly retract the margins of the cortisectomy [Video 1]. The folded tubular retractor was passed into the hematoma cavity within the opened speculum that kept the brain tissue retracted. The folded tubular brain retractor retained its original shape and size after the removal of the tissue forceps and speculum. About 30 cm long and 4 mm diameter, 0° scope (Karl Storz GmbH and Co. Tuttlingen, Germany) was used for surgery. A scope holder was used to fix the telescope with its sheath, to allow the surgeon to work with both his/her hands to evacuate the hematoma. Intraventricular blood could also be removed when there was extension of the hematoma within the ventricular cavity. A proper hemostasis was achieved using bipolar forceps [Figure 3]. A proper visualization and a good magnification was achieved in all the cases. The surrounding brain tissue and hematoma could be seen well due to the transparent nature of the tube. Any bleeding vessel could be controlled using the bimanual technique utilizing the bipolar forceps and the hemostatic agents. Gently pushing of the tubular retractor deeper into the hematoma cavity helped in controlling the bleeding. The dura was kept open following surgery. A good decompression of the brain was ensured in all the cases and its surface was usually seen to be >1 cm away from the dural margin following the clot evacuation. The small bone flap was replaced and a subgaleal suction drain was kept. The tubular retractor used during surgery could be autoclaved, sterilized by activated dialdehyde solution (Cidex solution) or by ethylene oxide (ETO) sterilization. A total of 270 patients in whom the hypertensive basal ganglionic hematoma was removed using the endoscope and tubular retractor were included in the study. Their age ranged from 32 to 78 years (with the average age being 58 years). There were 172 male patients. The spot sign was observed in 12 (12.5%) patients out of the 96 cases with a small hematoma, who were subjected to the CT angiography. Out of these 12 patients, 4 (33.3%) had an enlargement of the hematoma and were operated. Ten (11.9%) patients out of 84 who did not have the spot sign also had enlargement of the hematoma and had to be operated upon (a total 14 patients had enlargement of the hematoma and underwent surgery). The hematoma volume ranged from 30 to 80 ml (with the average volume being 46 ml). The average hematoma volume of patients who died or survived was 61.69 ± 12.479 and 44.11 ± 10.040 ml, respectively. There were 94 patients with an associated IVH. The time from the occurrence of stroke to the conductance of surgery ranged from 10 to 236 h (average 19 h). Fourteen (5.2%) patients were initially placed on conservative treatment and were operated due to the expansion of their clot and a deterioration in their neurological status. Although our aim was to operate as early as possible, the causes of delay in surgery were due to the subsequent decision to undertake surgery as a result of expansion of the hematoma in a patient who was undergoing conservative treatment, a late referral, and due to the delay in surgery while awaiting the reversal of anticoagulation in patients whose neurological status permitted a delay in surgery. The average stay in the intensive care unit (ICU) was 6 days (range 1–17 days). There were 34 patients with spontaneous intracranial hematoma who were receiving antiplatelet or anticoagulation treatment during this period. There were four patients (two each in the anticoagulant and antiplatelet therapy group) with a large hematoma, a gross midline shift and unilateral pupillary abnormality. All four patients underwent emergency surgery without waiting for the INR normalization or full correction of the platelet abnormality, although an urgent attempt at reversal of the effects of anticoagulant therapy and correction of the platelet abnormalities were made. When patients were on coumadin (warfarin) therapy, they were simultaneously given vitamin K and fresh frozen plasma (FFP) on an emergency basis. Platelet transfusion was given when patients were on aspirin or clopidogrel. There was bleeding within the hematoma cavity in one patient on antiplatelet treatment and this patient subsequently died; whereas, three other patients who also had bleeding within the surgical cavity survived without any significant re-bleeding after re-evacuation of their clot. There were five more patients during this period in the anticoagulant and antiplatelet therapy group who presented with dilated and fixed pupils who could not be operated. There were six patients on anticoagulant therapy, who were in a stable neurological status of GCS 13–14, without any pupillary abnormality. Surgery was undertaken in them after normalization of their INR. There were 19 more patients on anticoagulant and antiplatelet therapy who had an intracerebral hematoma in a location other than the basal ganglionic region. These patients were not included in this study. The pre-operative midline shift ranged from 4.3 to 12.7 mm (average 8.3 mm), which reduced to an average shift of 2.7 mm (range 0.0–3.7 mm) after surgery. The pre-operative mean midline shift among the patients who died was 9.48 ± 1.184 mm while it was 8.08 (±1.531) mm among those who survived; this difference was statistically significant (t = 4.753; P < 0.0001). These results are shown in [Table 2]. The patients in both the cohorts (those who died and those who survived) demonstrated a considerable reduction in the post-operative mean midline shift from their respective pre-operatively observed brain shift (t = 26.100, P < 0.0001 and t = 35.154, P < 0.0001). The hematoma removal ratio ranged from 60 to 99% with the average ratio being 90%. The duration of surgery ranged from 60 to 190 min with an average duration of 90 min. The blood loss was 30–250 ml (the average blood loss being 60 ml). There were 8, 13, 22, 41, 53, 59, 44, 16, 9, and 5 patients having the pre-operative GCS score of 5 to 14, respectively [Table 3]. The average GCS before surgery was 9.37. There were 13, 17, 21, 29, 41, 36, 55, 18, and 11 patients having the GCS score of 7 to 15, respectively, when evaluated after the 7th post-operative day [Table 3]. 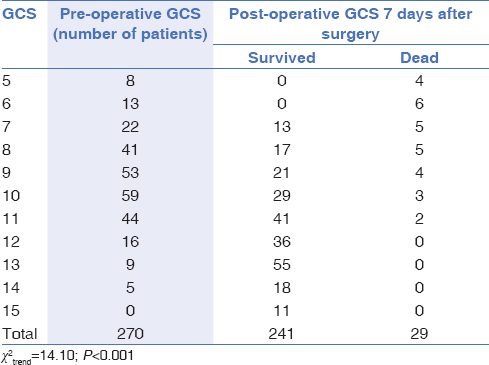 The average GCS score at the 7th post-operative day was 11.3 in 241 survivors. An improvement from the average pre-operative GCS of 9.4 to the average postoperative GCS score of 11.3 occurred after surgery. A lower GCS was associated with a significantly higher mortality (χ2trend= 14.10; P < 0.001). A good visualization of the hematoma with the surrounding brain and a proper hemostasis could be achieved in all the cases. A gentle inwards pushing of the tubular retractor helped in controlling the bleeding. A post-operative mortality occurred in 29 patients (10.7%). Larger the volume of hematoma (t = 8.665; P < 0.0001), more the operative time (t = 3.491; P < 0.001), more the pre-operative midline shift (t = 4.753; P < 0.0001), and a poorer GCS (χ2trend= 14.10; P < 0.001) were found to have a significantly higher mortality. While age (t = 0.129; P > 0.05), gender (M/F) (χ2 = 0.038; P > 0.05), a post-operative midline shift (t = −0.599; P > 0.05), a delay in surgery after the stroke (t = 1957; P > 0.05), the presence of diabetes mellitus (χ2 = 0.069; P > 0.05), a history of smoking (χ2 = 0.306; P > 0.05) and alcohol intake (χ2 = 2.430; P > 0.05) were found to have no significant difference in the clinical outcome [Table 2]. A good outcome (GOS 4–5) was observed in 192 (71%) patients at 6 months after surgery [Table 4]. A poor outcome (GOS 2–3) was observed in 49 (18%). patients. The average GOS score at 6 months was 4.1 in the patients who survived in our study. A significant linear trend (χ2trend= 30.136; P < 0.0001) was observed in the pre-operative GCS and GOS. The patients with a better pre-operative GCS were associated with a better GOS. Two patients at the start of the study (among the first 30 patients) required changing over from an endoscope to a microscope to control bleeding. The conversion surgery could be performed using the same incision and there was no need for a bigger craniotomy while using the microscope. There was no brain swelling in any of the patients. There was no infection. There was no procedure-related contusion or any other injury to the brain. The average duration of suction drain was 3.4 days (range 3–5 days). The follow-up period ranged from 7 to 115 months, with an average of 61 months. There were 51 patients who underwent hematoma evacuation with the help of the microscope and the tubular retractor during same period. This was performed by six neurosurgeons who were not experienced in endoscopy. The tubular retractor was used by these surgeons also. The size of the incision was also the same. There was no significant difference in the post-operative residual clot, the re-bleeding rate, and in the GOS between the patients managed utilizing the endoscope or the microscope. Endoscopic surgeries are frequently used in recent times in various neurosurgical ailments such as brain abscesses,, hydrocephalus,, arachnoid cysts,, cervical pathologies,, and in anomalies of cranio-vertebral junction, etc. Endoscopic techniques were found to be very effective and safe in the present series. There was an improvement in the average pre-operative GCS from 9.4 to 11.3 in the present study. A good outcome (GOS 4–5) was observed in 71% patients at 6 months after surgery. Similar observations were made in other series where an endoscope had been used.,,,,,,,, The endoscopic approach was found to be very effective and safe in evacuation of the ICH, even when the approach was performed in the elderly patients. It was found to be safer and more effective in evacuating the hematoma when compared to the utilization of a craniotomy.,, The endoscopic treatment promoted an earlier recovery when compared to the microscopic approach that required the performance of a craniotomy. The former technique was found to be a minimal invasive approach that was more effective for hematoma evacuation as compared to the burr hole drainage with urokinase infusion and catheter installation., There was a higher hematoma evacuation rate, a better functional and neurological outcome, and lower rate of complications and mortality in the patients who underwent endoscopic surgery as compared to those who underwent stereotaxy., The outcome in the endoscopic group was better as compared to the medical treatment group, with a higher chance of survival and a trend towards a better quality of life in the operated group. We were able to remove a substantial amount of hematoma (average of 90%) using this technique without causing any significant damage to the brain. This was due to the soft nature of tubular retractor and the small cortical opening required to reach the hematoma. The endoscope has been found to be a minimal invasive tool as compared to the traditional surgical approach by other authors also. It may offer an advantage over the conventional surgical technique due to a lesser disruption of the overlying cortex and white matter fiber tracts. The endoscopic technique allows for a better hematoma evacuation using a long trajectory with minimal amount of damage to the normal brain. The average duration of surgery and stay in the ICU was short in present study. Similar observations of a shorter duration of surgery and lesser median stay in the ICU were made in the other studies also. We were able to control the intraoperative bleeding effectively in our series. A similar observation has been made by other authors also. The endoscopic evacuation of the hematoma allows for a good control of the intraoperative bleeding. The monoshaft bipolar cautery, and a mixture of Floseal hemostatic matrix (Baxter, India) and platelets can be applied directly to the wall of the hematoma cavity for achieving a prompt hemostasis. The local applications of the hemostatic matrix along the walls shortens the operation time. The stereotactic assistance, combining the endoscope with ultrasonography, the suction irrigation, and the expandable cannula system can help in performing surgery in a better way. A rigid or flexible endoscope with an external ventricular drainage device for the management of the intraventricular hematoma [the Penumbra Apollo system (Penumbra Inc, Alameda, California)],,, were found to be useful in the management of the intracerebral hematoma. An endoscopic evacuation can be combined with coiling of the aneurysm in a single sitting, in the presence of severe IVH associated with an aneurysmal bleed into the brain parenchyma. Endoscopic removal of the clot with or without third ventriculostomy has been found to be an effective treatment option as compared to an external ventricular drainage., Although we did not used the dual channel port, it has been found to facilitate a bimanual procedure. We used a middle frontal gyrus approach in most of our cases. The choice of the surgical approach should be tailored for each patient based on the preoperative neuroimaging evaluation. The hematoma should be approached along its long axis and the injury to the white fiber tracts should be avoided. We used an eyebrow incision in some patients in our study; similarly, an appropriate entry point was found to be effective in the ICH removal. This approach allows for an optimal trajectory to the hematoma along its long axis, making it possible to evacuate the clot without causing damage to the normal brain. Trans-lower-Rolandic-point approach, trans-Sylvian trans-insular approach, transcortical frontal approach, and image-guided trans-sulcal techniques have been described, which have been found to be safe and effective. We combined the tubular retractor with the endoscope to help perform surgery in a more effective way. Our tubular retractor has the advantages of being inexpensive, simple, effective, and safe. This requires a very small brain opening and produces a low brain-retracting pressure. It is soft and thereby minimizes retractor-induced brain trauma. It is light-weight and can be moved in any direction, without the need of any retractor holder. The transparent tube allows for the continuous observation of the surrounding brain tissue or hematoma. The use of the tubular retractor can avoid lens soiling, and also helps in controlling bleeding. Gently pushing the retractor deep into field helps in controlling bleeding. Tubular retractors help in keeping the tract open, which allows a bimanual dissection. Similar reports of significant decompression of large and deep-seated hematomas are available using port surgery.,, The endoscopic port surgery in the air medium provides a clear image, and hemorrhage can be better seen and controlled as compared to the liquid medium. Three trials involving the endoscopic management of ICH are being conducted to find out a better treatment strategy. The endoscopic surgery versus conservative treatment for the moderate-volume hematoma in spontaneous basal ganglia hemorrhage (ECMOH) trial is on-going which is comparing endoscopic surgery plus the best medical treatment with the conservative treatment. The international verapamil-trandolapril study (INVEST) multi-center trial is being undertaken to evaluate the safety and efficacy of endoscopic evacuation of ICH using the Apollo device (Penumbra Inc., Alameda, California) as compared to medical management. The minimally invasive surgery treatment for the patients with spontaneous supratentorial intracerebral hemorrhage (MISTICH) multi-center randomized trial is also going on to compare endoscopic surgery, craniotomy, and stereotactic aspiration in the presence of spontaneous ICH. Hopefully, we will get better answers regarding the optimal treatment in ICH very soon. Although the post-operative mortality rate was about 11%, there was no infection or any significant re-bleeding in the present series. There was no contusion or infarct. Larger the volume of hematoma, more the operative time, more the pre-operative midline shift, and poorer the GCS, the mortality was also significantly higher. The patients with a better pre-operative GCS were associated with a better GOS. Age, gender, post-operative midline shift, delayed surgery after stroke, the presence of diabetes mellitus, the history of smoking and alcohol intake did not have influence on the clinical outcome in the present series. The GCS, age, ICH volume, presence of IVH,, and volume of peri-hemorrhagic edema (PHE) have been found to affect the functional outcome in one study. Reduction of PHE could minimize secondary brain injury. Diabetes mellitus, a midline shift of >10 mm, smoking, alcoholic consumption, hydrocephalus, and an operating time >2 h was also found to be important factors in determining the ultimate outcome in the other series. The proper management of ICH, including an early hemostasis to prevent hematoma growth, removal of the clot, clearance of the IVH, and an adequate blood pressure control were found to improve the functional outcomes in ICH in another study. Timely and aggressive management, including blood pressure management and reversal of coagulopathy, an early surgical intervention, and prevention of secondary brain injury have been found to improve the prognosis by the other group. We gratefully acknowledge the kind help provided by Arvind Kavishwar, Principal Technical Officer (Bio Statistics), Department of Health Research, Indian Council of Medical Research, National Institute for Research in Tribal Health, Ministry of Health and Family Welfare, Government of India, Nagpur Road, PO. Garha, Jabalpur 482 003 MP, India. Mendelow AD, Gregson BA, Fernandes HM, Murray GD, Teasdale GM, Hope DT, et al. Early surgery versus initial conservative treatment in patients with spontaneous supratentorial intracerebral haematomas in the international surgical trial in intracerebral haemorrhage (STICH): A randomised trial. Lancet 2005;365:387-97. Mendelow AD, Gregson BA, Rowan EN, Murray GD, Gholkar A, Mitchell PM, et al. Early surgery versus initial conservative treatment in patients with spontaneous supratentorial lobar intracerebral haematomas (STICH II): A randomised trial. Lancet 2013;382:397-408. Thabet AM, Kottapally M, Hemphill JC 3rd. Management of intracerebral hemorrhage. Handb Clin Neurol 2017;140:177-94. Steiner T, Kaste M, Forsting M, Mendelow D, Kwiecinski H, Szikora I, et al. Recommendations for the management of intracranial haemorrhage – Part I: Spontaneous intracerebral haemorrhage. The European stroke initiative writing committee and the writing committee for the EUSI executive committee. Cerebrovasc Dis 2006;22:294-316. Toyoda K, Steiner T, Epple C, Kern R, Nagayama M, Shinohara Y, et al. Comparison of the European and Japanese guidelines for the acute management of intracerebral hemorrhage. Cerebrovasc Dis 2013;35:419-29. Shinohara Y, Yanagihara T, Abe K, Yoshimine T, Fujinaka T, Chuma T, et al. III. Intracerebral hemorrhage. J Stroke Cerebrovasc Dis 2011;20:S74-99. Kim JE, Ko SB, Kang HS, Seo DH, Park SQ, Sheen SH, et al. Clinical practice guidelines for the medical and surgical management of primary intracerebral hemorrhage in Korea. J Korean Neurosurg Soc 2014;56:175-87. Cho DY, Chen CC, Lee HC, Lee WY, Lin HL. Glasgow coma scale and hematoma volume as criteria for treatment of putaminal and thalamic intracerebral hemorrhage. Surg Neurol 2008;70:628-33. Hemphill JC 3rd, Greenberg SM, Anderson CS, Becker K, Bendok BR, Cushman M, et al. Guidelines for the management of spontaneous intracerebral hemorrhage: A guideline for healthcare professionals from the American Heart Association/American Stroke Association. Stroke 2015;46:2032-60. Nagasaka T, Inao S, Wakabayashi T. What does the CT angiography “spot sign” of intracerebral hemorrhage mean in modern neurosurgical settings with minimally invasive endoscopic techniques? Neurosurg Rev 2013;36:341-8. Son W, Park J. Significant risk factors for postoperative enlargement of basal ganglia hematoma after frameless stereotactic aspiration: Antiplatelet medication and concomitant IVH. J Korean Neurosurg Soc 2017;60:591-6. Takeuchi S, Wada K, Nagatani K, Otani N, Mori K. Decompressive hemicraniectomy for spontaneous intracerebral hemorrhage. Neurosurg Focus 2013;34:E5. Heuts SG, Bruce SS, Zacharia BE, Hickman ZL, Kellner CP, Sussman ES, et al. Decompressive hemicraniectomy without clot evacuation in dominant-sided intracerebral hemorrhage with ICP crisis. Neurosurg Focus 2013;34:E4. Li Q, Yang CH, Xu JG, Li H, You C. Surgical treatment for large spontaneous basal ganglia hemorrhage: Retrospective analysis of 253 cases. Br J Neurosurg 2013;27:617-21. Esquenazi Y, Savitz SI, El Khoury R, McIntosh MA, Grotta JC, Tandon N, et al. Decompressive hemicraniectomy with or without clot evacuation for large spontaneous supratentorial intracerebral hemorrhages. Clin Neurol Neurosurg 2015;128:117-22. Zhao JZ, Zhou LF, Zhou DB, Wang RZ, Wang M, Wang DJ, et al. Computed tomography-guided aspiration versus key-hole craniotomy for spontaneous putaminal haemorrhage: A prospective comparison of minimally invasive procedures. Hong Kong Med J 2009;15:274-9. Barlas O, Karadereler S, Bahar S, Yesilot N, Krespi Y, Solmaz B, et al. Image-guided keyhole evacuation of spontaneous supratentorial intracerebral hemorrhage. Minim Invasive Neurosurg 2009;52:62-8. Angileri FF, Esposito F, Priola SM, Raffa G, Marino D, Abbritti RV, et al. Fully endoscopic freehand evacuation of spontaneous supratentorial intraparenchymal hemorrhage. World Neurosurg 2016;94:268-72. Auer LM, Deinsberger W, Niederkorn K, Gell G, Kleinert R, Schneider G, et al. Endoscopic surgery versus medical treatment for spontaneous intracerebral hematoma: A randomized study. J Neurosurg 1989;70:530-5. Auer LM, Ascher PW, Heppner F, Ladurner G, Boné G, Lechner H, et al. Does acute endoscopic evacuation improve the outcome of patients with spontaneous intracerebral hemorrhage? Eur Neurol 1985;24:254-61. Beynon C, Schiebel P, Bösel J, Unterberg AW, Orakcioglu B. Minimally invasive endoscopic surgery for treatment of spontaneous intracerebral haematomas. Neurosurg Rev 2015;38:421-8. Cho DY, Chen CC, Chang CS, Lee WY, Tso M. Endoscopic surgery for spontaneous basal ganglia hemorrhage: Comparing endoscopic surgery, stereotactic aspiration, and craniotomy in noncomatose patients. Surg Neurol 2006;65:547-55. Dye JA, Dusick JR, Lee DJ, Gonzalez NR, Martin NA. Frontal burr hole through an eyebrow incision for image-guided endoscopic evacuation of spontaneous intracerebral hemorrhage. J Neurosurg 2012;117:767-73. Hsieh PC, Cho DY, Lee WY, Chen JT. Endoscopic evacuation of putaminal hemorrhage: How to improve the efficiency of hematoma evacuation. Surg Neurol 2005;64:147-53. Liu L, Liu X, Zhang F, Yao X, Xue P, Shen H, et al. Dual-channel minimally invasive endoscopic port for evacuation of deep-seated spontaneous intracerebral hemorrhage with obstructive hydrocephalus. World Neurosurg 2016;91:452-9. Longatti P, Basaldella L. Endoscopic management of intracerebral hemorrhage. World Neurosurg 2013;79:S17.e1-7. Miller CM, Vespa P, Saver JL, Kidwell CS, Carmichael ST, Alger J, et al. Image-guided endoscopic evacuation of spontaneous intracerebral hemorrhage. Surg Neurol 2008;69:441-6. Nishihara T, Nagata K, Tanaka S, Suzuki Y, Izumi M, Mochizuki Y, et al. Newly developed endoscopic instruments for the removal of intracerebral hematoma. Neurocrit Care 2005;2:67-74. Orakcioglu B, Beynon C, Bösel J, Stock C, Unterberg AW. Minimally invasive endoscopic surgery for treatment of spontaneous intracerebral hematomas: A single-center analysis. Neurocrit Care 2014;21:407-16. Ochalski P, Chivukula S, Shin S, Prevedello D, Engh J. Outcomes after endoscopic port surgery for spontaneous intracerebral hematomas. J Neurol Surg A Cent Eur Neurosurg 2014;75:195-205. Przybylowski CJ, Ding D, Starke RM, Webster Crowley R, Liu KC. Endoport-assisted surgery for the management of spontaneous intracerebral hemorrhage. J Clin Neurosci 2015;22:1727-32. Qiu Y, Lin Y, Tian X, Luo Q. Hypertensive intracranial hematomas: Endoscopic-assisted keyhole evacuation and application of patent viewing dissector. Chin Med J (Engl) 2003;116:195-9. Sadahiro H, Nomura S, Goto H, Sugimoto K, Inamura A, Fujiyama Y, et al. Real-time ultrasound-guided endoscopic surgery for putaminal hemorrhage. J Neurosurg 2015;123:1151-5. Stachura K, Libionka W, Czepko R. Endoscopic treatment of the spontaneous intracerebral hematomas. Neurol Neurochir Pol 2004;38:489-94. Tanriverdi SR, Turhan T, Uygur O, Koroglu OA, Yalaz M, Kultursay N, et al. Endoscopic evacuation of cerebellar hematoma in a term newborn. Brain Dev 2013;35:881-4. Wan J, Jiang C. Development and clinical application of a brain stereotactic endoscope. Zhonghua Wai Ke Za Zhi 1998;36:536-8. Wang WH, Hung YC, Hsu SP, Lin CF, Chen HH, Shih YH, et al. Endoscopic hematoma evacuation in patients with spontaneous supratentorial intracerebral hemorrhage. J Chin Med Assoc 2015;78:101-7. Waran V, Vairavan N, Sia SF, Abdullah B. A new expandable cannula system for endoscopic evacuation of intraparenchymal hemorrhages. J Neurosurg 2009;111:1127-30. Yadav YR, Yadav S, Sherekar S, Parihar V. A new minimally invasive tubular brain retractor system for surgery of deep intracerebral hematoma. Neurol India 2011;59:74-7. Rennert RC, Signorelli JW, Abraham P, Pannell JS, Khalessi AA. Minimally invasive treatment of intracerebral hemorrhage. Expert Rev Neurother 2015;15:919-33. Barnes B, Hanley DF, Carhuapoma JR. Minimally invasive surgery for intracerebral haemorrhage. Curr Opin Crit Care 2014;20:148-52. Yadav YR, Parihar V, Kher Y. Complication avoidance and its management in endoscopic neurosurgery. Neurol India 2013;61:217-25. Gajdhar M, Yadav YR. A case of thalamic abscess treated by endoscopic surgery. Neurol India 2005;53:345-6. Yadav YR, Sinha M, Neha, Parihar V. Endoscopic management of brain abscesses. Neurol India 2008;56:13-6. Yadav YR, Jaiswal S, Adam N, Basoor A, Jain G. Endoscopic third ventriculostomy in infants. Neurol India 2006;54:161-3. Yadav YR, Parihar V, Agrawal M, Bhatele PR. Endoscopic third ventriculostomy in tubercular meningitis with hydrocephalus. Neurol India 2011;59:855-60. Yadav YR, Parihar V, Sinha M, Jain N. Endoscopic treatment of the suprasellar arachnoid cyst. Neurol India 2010;58:280-3. Yadav YR, Basoor A, Todorov M, Parihar V. Endoscopic management of large multicompartmental intraventricular arachnoid cyst extending from foramen magnum to foramen of Monro. Neurol India 2010;58:481-4. Yadav YR, Parihar V, Ratre S, Kher Y. Endoscopic anterior decompression in cervical disc disease. Neurol India 2014;62:417-22. Yadav YR, Parihar V, Ratre S, Kher Y, Bhatele PR. Endoscopic decompression of cervical spondylotic myelopathy using posterior approach. Neurol India 2014;62:640-5. Yadav YR, Ratre S, Parhihar V, Dubey A, Dubey NM. Endoscopic technique for single-stage anterior decompression and anterior fusion by transcervical approach in atlantoaxial dislocation. Neurol India 2017;65:341-7. Feng Y, He J, Liu B, Yang L, Wang Y. Endoscope-assisted keyhole technique for hypertensive cerebral hemorrhage in elderly patients: A randomized controlled study in 184 patients. Turk Neurosurg 2016;26:84-9. Zhu H, Wang Z, Shi W. Keyhole endoscopic hematoma evacuation in patients. Turk Neurosurg 2012;22:294-9. Cai Q, Zhang H, Zhao D, Yang Z, Hu K, Wang L, et al. Analysis of three surgical treatments for spontaneous supratentorial intracerebral hemorrhage. Medicine (Baltimore) 2017;96:e8435. Nagasaka T, Tsugeno M, Ikeda H, Okamoto T, Inao S, Wakabayashi T, et al. Early recovery and better evacuation rate in neuroendoscopic surgery for spontaneous intracerebral hemorrhage using a multifunctional cannula: Preliminary study in comparison with craniotomy. J Stroke Cerebrovasc Dis 2011;20:208-13. Nishihara T, Morita A, Teraoka A, Kirino T. Endoscopy-guided removal of spontaneous intracerebral hemorrhage: Comparison with computer tomography-guided stereotactic evacuation. Childs Nerv Syst 2007;23:677-83. Li Y, Yang R, Li Z, Yang Y, Tian B, Zhang X, et al. Surgical evacuation of spontaneous supratentorial lobar intracerebral hemorrhage: Comparison of safety and efficacy of stereotactic aspiration, endoscopic surgery, and craniotomy. World Neurosurg 2017;105:332-40. Li Z, Li Y, Xu F, Zhang X, Tian Q, Li L, et al. Minimal invasive puncture and drainage versus endoscopic surgery for spontaneous intracerebral hemorrhage in basal ganglia. Neuropsychiatr Dis Treat 2017;13:213-9. Ding D, Przybylowski CJ, Starke RM, Sterling Street R, Tyree AE, Webster Crowley R, et al. A minimally invasive anterior skull base approach for evacuation of a basal ganglia hemorrhage. J Clin Neurosci 2015;22:1816-9. Yamashiro S, Hitoshi Y, Yoshida A, Kuratsu J. Effectiveness of endoscopic surgery for comatose patients with large supratentorial intracerebral hemorrhages. Neurol Med Chir (Tokyo) 2015;55:819-23. Nagasaka T, Tsugeno M, Ikeda H, Okamoto T, Inao S, Wakabayashi T, et al. A novel monoshaft bipolar cautery for use in endoscopic intracranial surgery. A short technical note. Clin Neurol Neurosurg 2011;113:607-11. Killory BD, Kilbourn KJ, Ollenschleger M. A novel use of direct platelet application during surgery for clopidogrel-associated intracerebral hemorrhage. World Neurosurg 2015;84:2078.e1-4. Luh HT, Huang AP, Yang SH, Chen CM, Cho DY, Chen CC, et al. Local hemostatic matrix for endoscope-assisted removal of intracerebral hemorrhage is safe and effective. J Formos Med Assoc 2018;117:63-70. Li Y, Zhang H, Wang X, She L, Yan Z, Zhang N, et al. 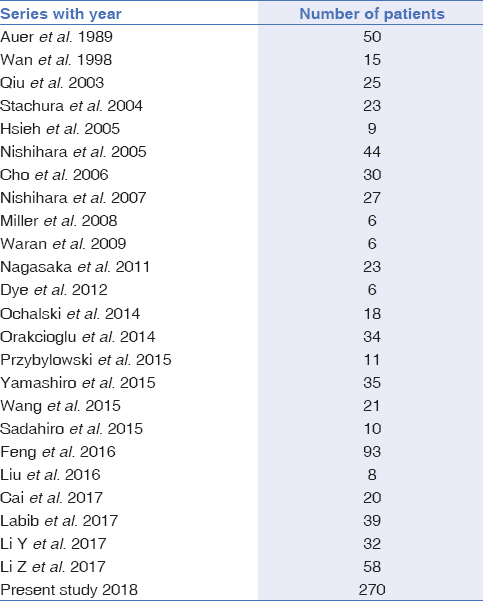 Neuroendoscopic surgery versus external ventricular drainage alone or with intraventricular fibrinolysis for intraventricular hemorrhage secondary to spontaneous supratentorial hemorrhage: A systematic review and meta-analysis. PLoS One 2013;8:e80599. Toyooka T, Kageyama H, Tsuzuki N, Ishihara S, Oka K. Flexible endoscopic aspiration for intraventricular casting hematoma. Acta Neurochir Suppl 2016;123:17-23. Spiotta AM, Fiorella D, Vargas J, Khalessi A, Hoit D, Arthur A, et al. Initial multicenter technical experience with the Apollo device for minimally invasive intracerebral hematoma evacuation. Neurosurgery 2015;11 Suppl 2:243-51. Tan LA, Lopes DK, Munoz LF, Shah Y, Bhabad S, Jhaveri M, et al. Minimally invasive evacuation of intraventricular hemorrhage with the Apollo vibration/suction device. J Clin Neurosci 2016;27:53-8. Mori R, Yuki I, Kajiwara I, Nonaka Y, Ishibashi T, Karagiozov K, et al. Hybrid operating room for combined neuroendovascular and endoscopic treatment of ruptured cerebral aneurysms with intraventricular hemorrhage. World Neurosurg 2016;89:727.e9-e12. Horváth Z, Veto F, Balás I, Kövér F, Dóczi T. Biportal endoscopic removal of a primary intraventricular hematoma: Case report. Minim Invasive Neurosurg 2000;43:4-8. Yadav YR, Mukerji G, Shenoy R, Basoor A, Jain G, Nelson A, et al. Endoscopic management of hypertensive intraventricular haemorrhage with obstructive hydrocephalus. BMC Neurol 2007;7:1. Zhong Z, Sun Y, Zhou H, Sun Q, Bian L. A new choice of minimally invasive surgery for intracerebral hemorrhage in the striatocapsular regions based on computed tomography scans. J Craniofac Surg 2014;25:1195-9. Chen CH, Lee HC, Chuang HC, Chen CC, Lee WY, Huang YI, et al. Transsylvian-transinsular approach for the removal of basal ganglia hemorrhage under a modified intracerebral hemorrhage score. J Craniofac Surg 2013;24:1388-92. Uzunov K. The transcortical frontal approach in putaminal hypertensive intracerebral haematomas. Khirurgiia (Sofiia) 2009;2-3:45-8. Labib MA, Shah M, Kassam AB, Young R, Zucker L, Maioriello A, et al. The safety and feasibility of image-guided brainPath-mediated transsulcul hematoma evacuation: A multicenter study. Neurosurgery 2017;80:515-24. Ratre S, Yadav YR, Parihar VS, Kher Y. Microendoscopic removal of deep-seated brain tumors using tubular retraction system. J Neurol Surg A Cent Eur Neurosurg 2016;77:312-20. Zan X, Li H, Liu W, Fang Y, Ma J, Lan Z, et al. Endoscopic surgery versus conservative treatment for the moderate-volume hematoma in spontaneous basal ganglia hemorrhage (ECMOH): Study protocol for a randomized controlled trial. BMC Neurol 2012;12:34. Fiorella D, Arthur AS, Mocco JD. 305 The INVEST Trial: A randomized, controlled trial to investigate the safety and efficacy of image-guided minimally invasive endoscopic surgery with Apollo vs. best medical management for supratentorial intracerebral hemorrhage. Neurosurgery 2016;63 Suppl 1:187. Zheng J, Li H, Guo R, Lin S, Hu X, Dong W, et al. Minimally invasive surgery treatment for the patients with spontaneous supratentorial intracerebral hemorrhage (MISTICH): Protocol of a multi-center randomized controlled trial. BMC Neurol 2014;14:206. Hu Y, Cao J, Hou X, Liu G. MIS score: Prediction model for minimally invasive surgery. World Neurosurg 2017;99:624-9. Zhou X, Chen J, Li Q, Ren G, Yao G, Liu M, et al. Minimally invasive surgery for spontaneous supratentorial intracerebral hemorrhage: A meta-analysis of randomized controlled trials. Stroke 2012;43:2923-30. Appelboom G, Bruce SS, Hickman ZL, Zacharia BE, Carpenter AM, Vaughan KA, et al. Volume-dependent effect of perihaematomal oedema on outcome for spontaneous intracerebral haemorrhages. J Neurol Neurosurg Psychiatry 2013;84:488-93. Kim H, Edwards NJ, Choi HA, Chang TR, Jo KW, Lee K, et al. Treatment strategies to attenuate perihematomal edema in patients with intracerebral hemorrhage. World Neurosurg 2016;94:32-41. Lowprukmanee N. Clinical outcome of the patients treated surgically for spontaneous intracerebral hematoma at Sawanpracharak hospital. J Med Assoc Thai 2013;96:669-77. Rincon F, Mayer SA. Intracerebral hemorrhage: Getting ready for effective treatments. Curr Opin Neurol 2010;23:59-64.
de Oliveira Manoel AL, Goffi A, Zampieri FG, Turkel-Parrella D, Duggal A, Marotta TR, et al. The critical care management of spontaneous intracranial hemorrhage: A contemporary review. Crit Care 2016;20:272. Mendelow AD. Operation versus non-operative treatment for spontaneous supratentorial intracerebral haemorrhage: Is a change in current clinical practice required?. Neurol India 2017;65:759-60. Yadav YR, Parihar V, Ratre S, Kher Y, Iqbal M. Microneurosurgical skills training. J Neurol Surg A Cent Eur Neurosurg 2016;77:146-54.